Got one of those March colds? In the old days, you might have turned to a March weed for help. Many roadsides will soon be lined with Coltsfoot, a wildflower whose bright yellow blooms are often mistaken for dandelions. Although it’s colorful and among the earliest and hardiest of the spring wildflowers, Coltsfoot was imported from Europe not for its beauty, but for its alleged abilities as a cough medicine. Its generic name, Tussilago, means “cough dispeller,” and for centuries its juices were used like Pertussin or Robitussin (notice those coughing “tusses”) from the drug store. 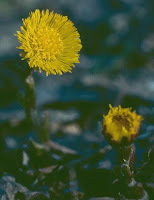 Ailing New England children in the 19th Century were fed Coltsfoot drops, made of plant extract and sugar. Don’t do it today, however. Modern research suggests ingesting Coltsfoot may cause liver tumors. Instead, enjoy Coltsfoot for a different characteristic. The import has adapted to some of the worst soils North America can offer. The most likely place to see it is in within a foot or two of highway pavement – soil permeated with winter sand and salt, oils from asphalt and cars, and, yes, litter. If there’s a terrain in need of beautifying, it’s our roadsides, especially in spring when we are hungry for outdoor color. This post-winter weed is a winner.